Tied 13-13 with 1:54 left in the game, the St. Louis Rams found themselves in a 3rd-and-1 on the Cardinals 33 yardline. 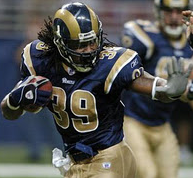 Looking to just run the clock down and kick the game-winning field goal, the Rams called two straight run plays for Steven Jackson, who had 130 rushing yards on the game. Jackson was stuffed twice, turning the ball over to the Cardinals and causing a 45% drop in win probability. Typically, running the ball on 3rd or 4th-and-short is the correct decision, and the Rams were certainly right to go for it in that situation. But, it got me thinking about trends in rushing and passing frequency and efficiency on 4th down. 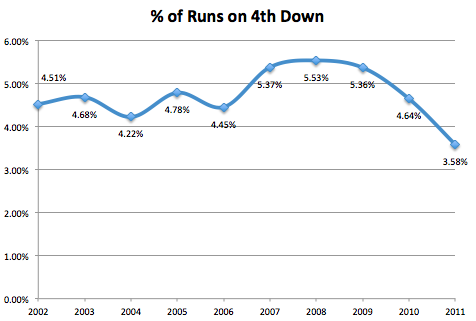 So far this season, teams have run the ball on 4th down just 3.6% of the time. This is down from an average of 4.7% over the last 10 years and a peak in 2008 of 5.5%. Assuming 4th down situations are roughly similar to those of year's past in terms of to go distance, field position, and other factors, this is a noteworthy decline. Passing efficiency has remained constant, though. 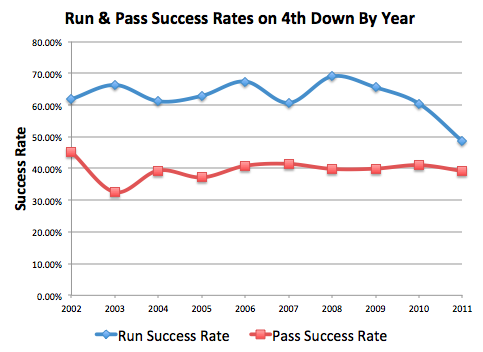 This year's pass success rate on 4th down of 39.3% is right at the league average over the last 10 years. That being said, runs are still successful almost an additional 10% of the time. This should be qualified, though, as there is a selection bias. Teams will rarely run the ball on anything other than 4th and short, so the pass success rate will reflect the tougher situations. So what is the cause of this year's drop in rushing efficiency on 4th down? Upon a cursory overview, it looks as though the blame falls on the running back. Typically, either the running back or quarterback will get the carry (with the occasional fullback carry peppered in, which, for simplicity, we will categorize under the running back). This year is no different, QBs have carried the ball just under 30% and RBs have carried just under 70% of the time - the same as the previous few years. Yet while there hasn't been much of a change in QB run success rate, RB run success rate is down from 55.6% to 38.6%. It is also notable that fullback carries on 4th down are down; there has only been 1 this year. Typically there are 10-20 fullback carries per year and fullbacks tend to register a much higher success rate than running backs. This could be due to the shorter distance to the line-of-scrimmage or the surprise factor of the quick handoff. Since the results are surprising, perhaps you should check the assumptions and see if to-go distance and game situations aren't materially different than years past? Are you counting punts/field goals in your denominator? Or are you saying that teams pass more than 90% on 4th down (when deciding to go for it)? Punts and field goals are counted as well. It is out of all possible play types on 4th down. Probably wrong, but could this be caused by teams going for it more on 4th down this year, and with more yards to go (passing then becoming a more logical option) ? Seems like yards to go would be a pretty important variable. No? Going into last week, 80% of 4th down run attempts were on 4th and 1, 9% on 4th and 2, 4% on 4th and 3, and 1 attempt on 4th and 4,6,7, and 17. In 2010, 75% of 4th down runs were on 4th and 1, 8% on 4th and 2, 3% on 4th and 3, and similar small frequencies on everything higher. This means that 4th-and-1 has actually been marginally higher frequency this year (and since you can't get closer, the distance to go will not be a differentiating factor). So, the average distance on 4th is marginally higher, which could explain the drop in run frequency, but should not affect the run success rate. The Jets used the FB handoff to Connor yesterday (twice). It was ultra-surprising the first time, and they ran it a second time for a TD. As you point out, since it has become so rare, it has also become so efficient when it's actually used.